From the looks of it, I was pretty sure that the blob was going to be something wrong with, or wrong on the surface of, one of the lenses, mirrors, or filters. Yes, it looked a little like an LCD ruined by being left in a freezing car overnight, but not quite. So I dug in to follow the light path through the projector and see if it would be apparent what was wrong. 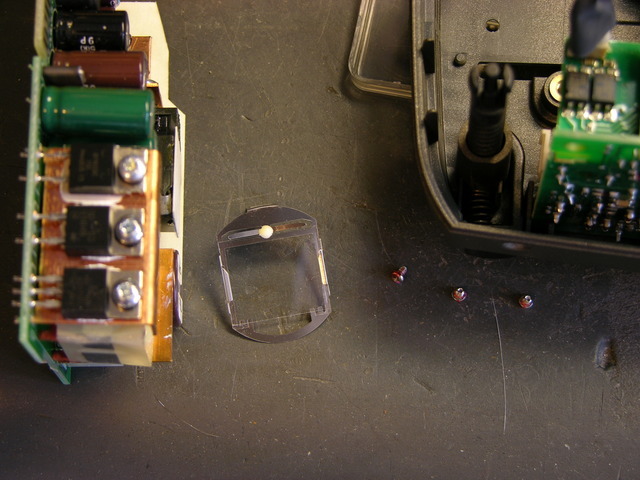 After popping the cover and removing the main circuit board, I could see most of the periscope-like light enclosure. I removed a couple of lenses that dropped in from above, which were clean, and looked at a couple of mirrors, which were also clean. The next thing I wanted to check was the LCDs. 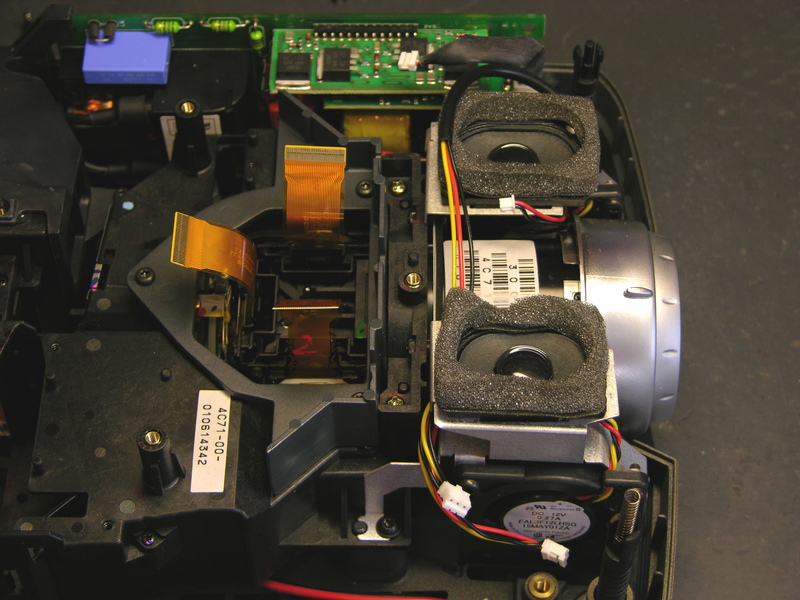 In order to get to them, I had to take off the collar above/around them, remove the two cooling fan / speaker assemblies, and remove the main lens. 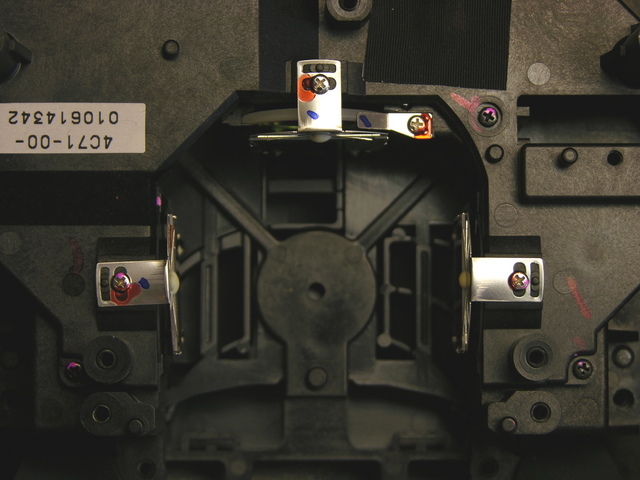 The LCDs were mounted to the lens carrier and looked fine; their removal left access to this cavity where the RGB light paths converge. I didn’t notice it until later, but someone had already been here before. Loctite on the RG screw tabs and missing from the B tab. From a different angle, the problem was obvious. The filter between the blue light path and the blue LCD is all melty. Bad. Here it is all shiny and ready for . . . whatever comes next. 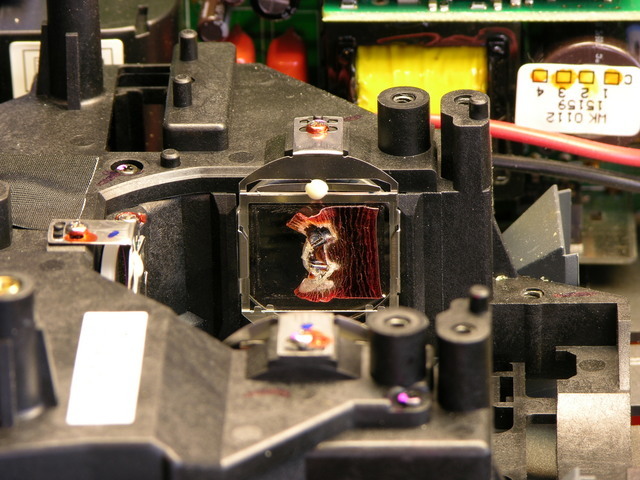 While I was in there, I detached and examined the other two filters. They didn’t look colored, just a light neutral grey in a very familiar sort of way. Apparently the filter isn’t what makes the blue blue (that’s the blue half-mirror further upstream), so maybe I can just put it back together and see what happens.